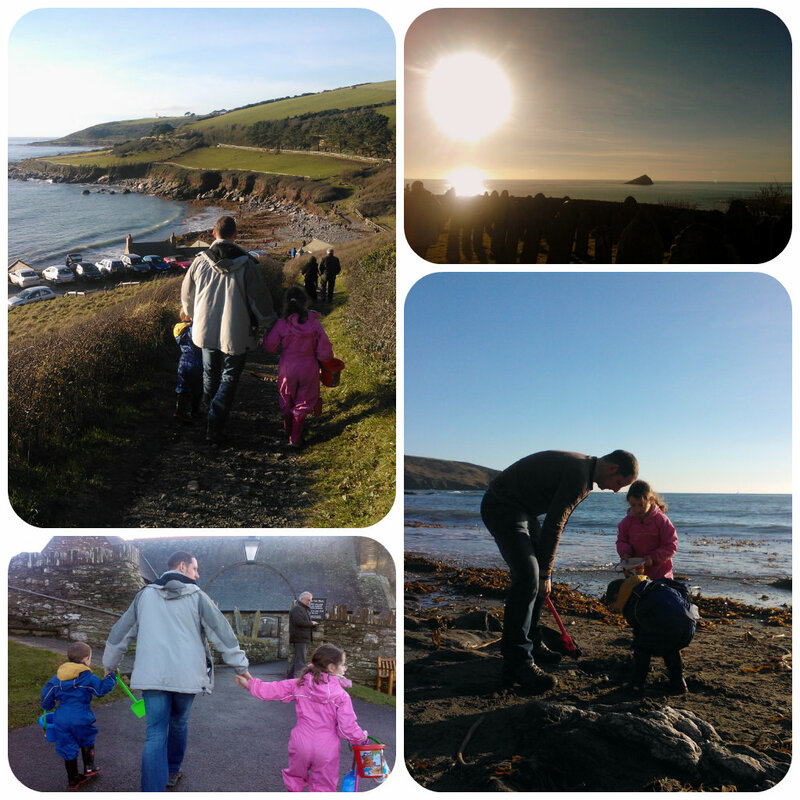 Wembury Beach – family fun in the January sun!! Waking up last Saturday to the glorious sunshine, we just knew it was a day to take advantage of. So we decided to head over to the beach which turned out to be packed, not a carpark space in site!! 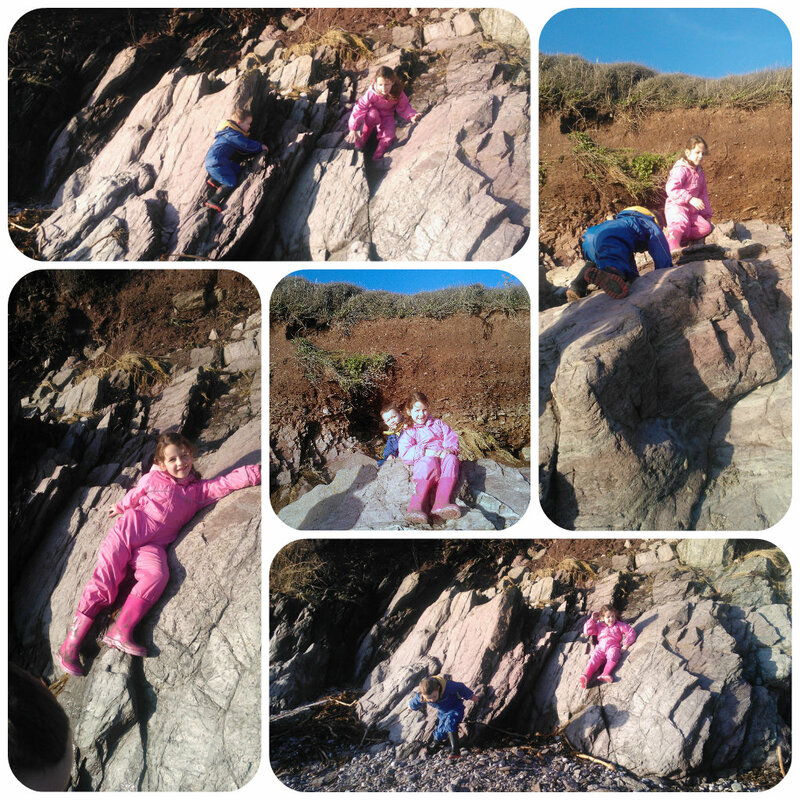 The tide was in, the beach was rocky, the few sandy spots were murky grey, gritty sand – but the children didn’t care!! Dressed in their rain suits, wellies and accompanied with buckets and spades they were in fresh air heaven, digging away, building dams with the rocks across the mini rivers than emanated down from the rocky cliff face, finding rectangular ‘car’ shaped rocks to drive through the makeshift sandy roads, braving the shallow waves hitting the shoreline to fill their buckets with seawater, they were in their element playing as the bright sunshine hit the beach for the afternoon. Buckets and spades at the ready, Miss M and Mister B couldn’t wait to get digging. With the tide in, there was little sand to be found amongst the rocks but this didn’t deter them one little bit. There were squeals of excitement as they dug in, trying to build the biggest hole they could! Mister B was excited by a rectangular shaped rock he found and decided it was a car. 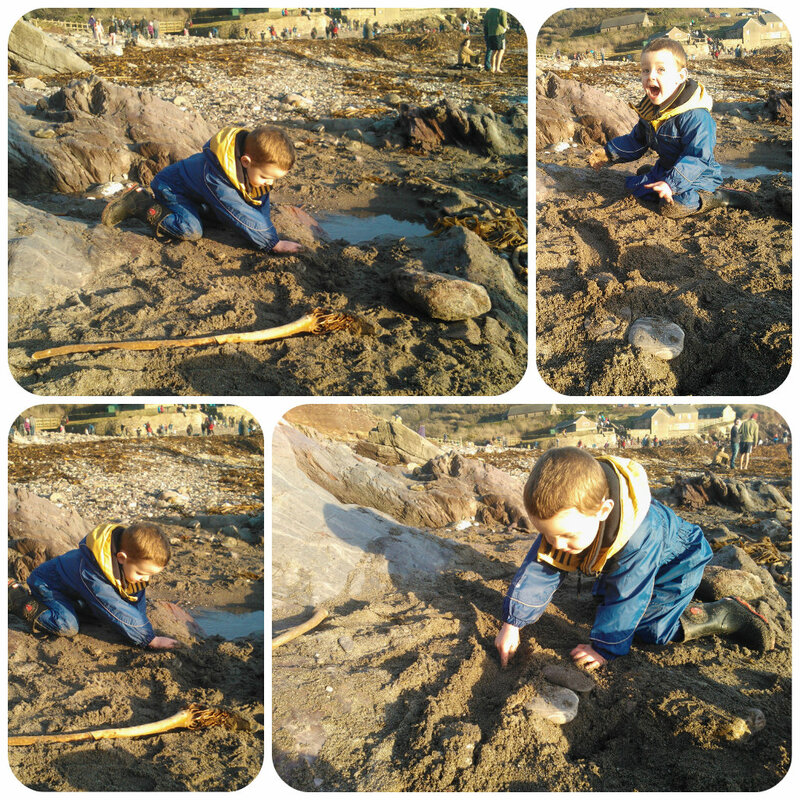 He then made a sandy track with his hand to drive his ‘car’ through. He was absolutely thrilled with his little road and just loved the freedom of the beach and fresh air to play in. Miss M was keen to have a little paddle and fill her bucket with water to fill their freshly dug hole. She loved waiting for each wave to come in although had to keep emptying her water filled wellies!! Not that it bothered her, it just seemed to add to her fun!! They then decided to venture over the rocks at the back of the beach and Miss M was eager to climb, while Mister B was desperate to copy. I wasn’t too keen so they posed for a couple of photos and came back down. All in all we had a fantastic afternoon at the beach. The children loved being outside, the thrill of the beach, however small and stony kept them entertained for hours and they were sad to go home, but after some dinner and a warm bath they were soon tucked away in their beds fast asleep for the night and mummy wasn’t far behind after spending time in the fresh sea air! 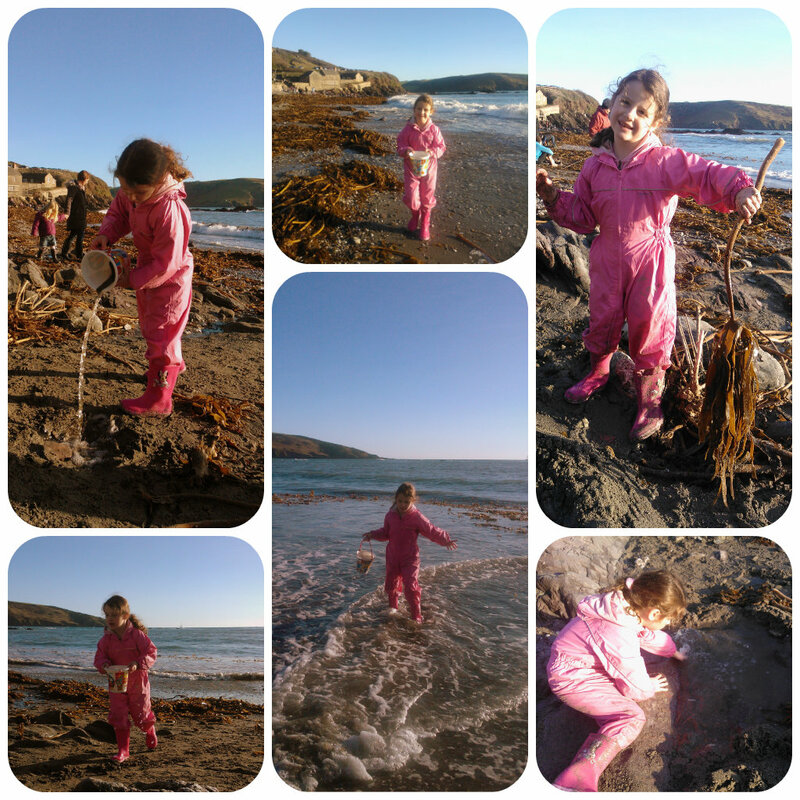 This entry was posted in Day to Day and tagged beach, Devon, kids, sand, sun, Wembury by Fiona Martin. Bookmark the permalink. Jenny @ The Brick Castle recently posted…My leg operation finally happened! What a great way to spend the afternoon. I bet it was lovely and quiet too, not many people will brave the beach in January even with this nice weather we are having! Looks like a great fun and a perfect day for it too! What a wonderful environment for the kids to grow up in, I’m rather jealous! over40andamumtoone recently posted…Time for a watch? Beach fun on a dry and sunny day – perfect. I can see from your photos that the children had a wonderful time playing and exploring. 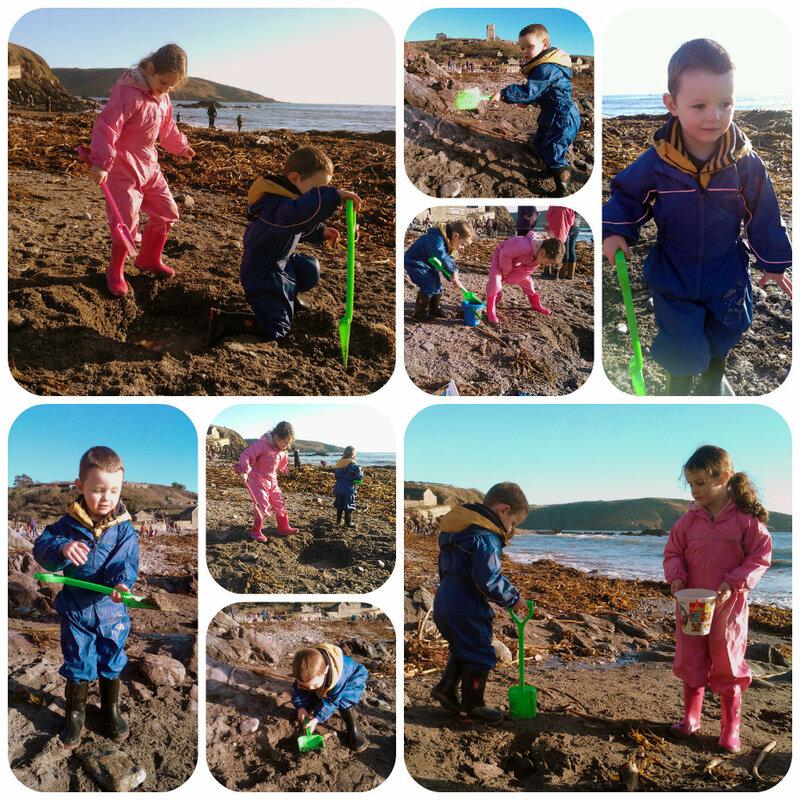 Being dressed in their wellies and waterproofs they were able to stay dry and warm and enjoy their time on the beach. Thanks for linking up and sharing with Country Kids. Looks gorgeous. I used to live near Modbury so know it well. Very jealous now that I live miles from the sea! We had the same idea, didn’t know when we would get another lovely sunny day so headed for our local beach. Your photos are great, look like a beach that has loads to offer. Love the activities you can get up to on a good beach. Ooh, I’m very envious of you living near the sea side. It looks like so much fun. Love your photo’s too. The Reading Residence recently posted…We’re Armed & Ready for Nature-Spotting! Wow, so this is where the sun has been. This looks so amazing! And I love how kitted out everyone is! Kim Carberry recently posted…David Emanuel Jeans – Review!! Gosh I wish I could just nip to the beach for an afternoon. Sounds like glorious fun. I guess everyone was taking advantage of the little sun that we have been getting! I love their excitement, especially your son’s face when he found the rectangular pebble.